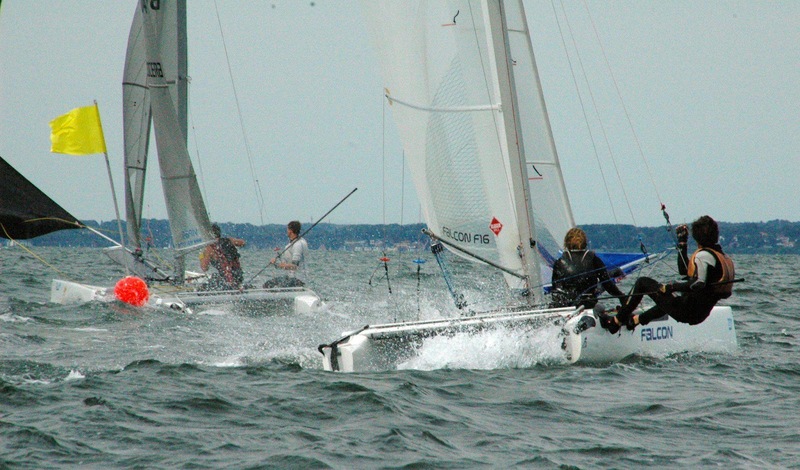 This year the F16 Worlds were held in Northern Germany, during the Travemünde Woche. 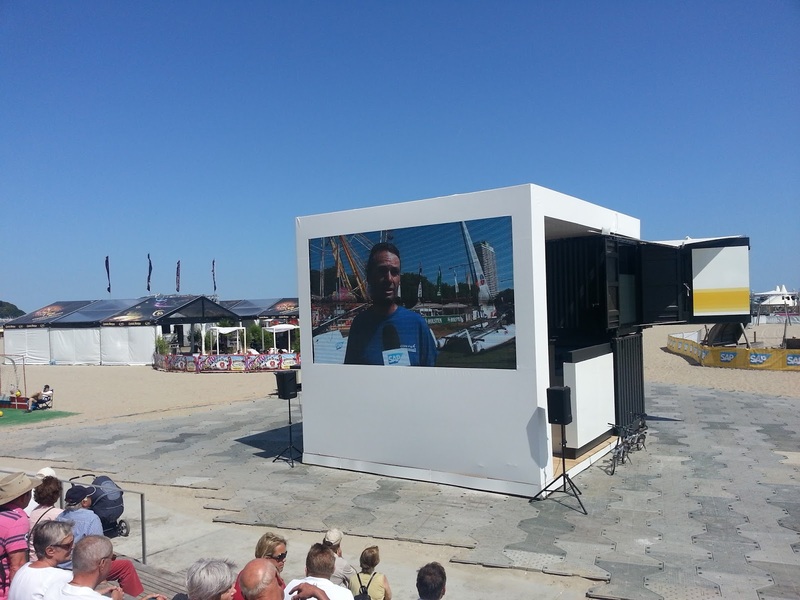 This is a very big sailing event, with a lot of boats and sailors present. 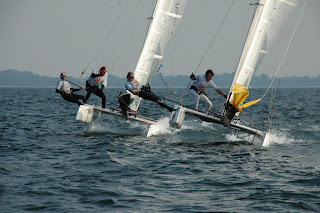 Not only the F16 were sailing, also the F18, Tornado, Hobie 16 and many monohull classes. 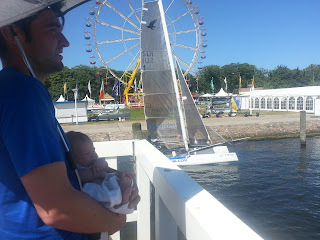 Since our first baby daughter Marie was born on May 25 we knew we wouldn’t sail this event. But as an European dealer for Falcon we decided to be there to provide service, support and spare parts to all the Falcon sailors. We had 8 teams ready to race, learn and get to know each other during the social parts of the event. 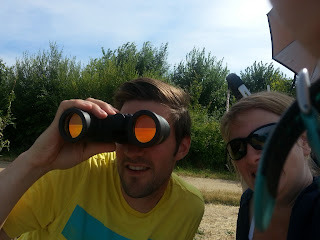 The teams were a great mixture of youth, mixed crews, 2 men sailing and Geert was also there sailing one-up. Countries represented: Belgium, Germany, Luxemburg and the Netherlands. In total the event had 32 contestants registered. All F16 brands were represented: AquaRaptor, Bimare, Cirrus, Falcon, Nacra and Viper. We travelled to Germany a few days before the event. We towed a RIB for the RBSC and we used this RIB to give a training session to the Falcon sailors on the Saturday before the racing started. 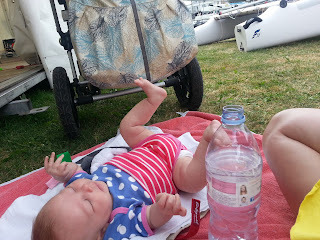 Also on the Friday evening we had a small informal coaching on racing preparation (wind direction, start procedure, racing rules) and boat preparation. For us it was a bit weird to be on the other side of the racing scene. Being at such a lovely event with super weather conditions (always sunny, hot and enough wind) but not racing ourselves felt awkward. But it was also for us a nice experience. 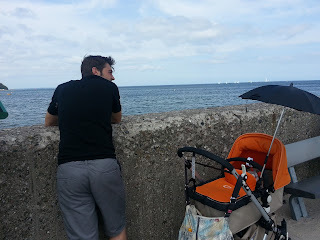 We had a great time with Marie (8 weeks old), walking along the promenade, watching the sailing from atop a cliff, being there when the sailors got back in the evening and going out to diner all together. Racing started on Monday with very light wind conditions. 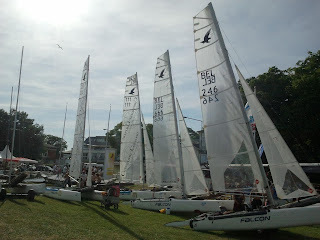 2 teams dominated the fleet: BEL666 (our boat!) 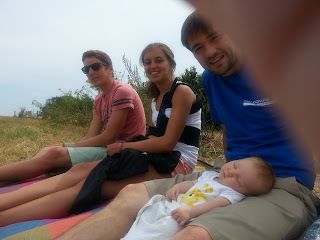 with Aurélie and Morgan crewing and SUI001 (Andi and KC!). They took respectively silver and gold that day. Very happy faces on shore that evening! The Travemünde Woche TV interviewed them both and they would be closely watched the next day during the SAP media course. This was a very cool way to make sailing more a spectator sport. On Tuesday the F16 could sail the SAP media course, this was a course in front of the beach and all boats got trackers on them and on the beach there was a special SAP area where you could watch the races on a big screen with live commentary from sailing journalists. Normally there was also on board footage (1 video kit on BEL666 and one on our other Youth Team (BEL111)) but unfortunately there were technical problems and the on board filming didn’t work. 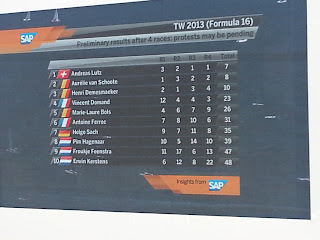 It was windier this day and Andi and Aurélie were falling down a bit in the ranking. 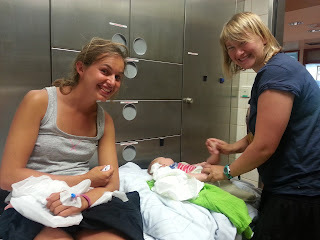 Luckily all was good, no other injuries and no more pain. No more sailing tough for her for the rest of the week. This was a pity, as they were really on fire and high in the ranking at that time. It’s also really sad to drive such a distance and then to be able to sail only 1 day. The next day Marie-Laure and Filip joined us for a day watching the racing on top of the cliff. Filip was very lucky tough to find Emilie, the sister of another youth team and she was willing to crew for him for the next days! And they did very well. 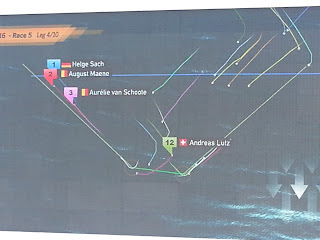 In the end they ended on a 19th place, but with a whole day not sailed (there was only 1 discard at this event, with 18 races sailed, so consistency was even more important, every mistake now was really punished). 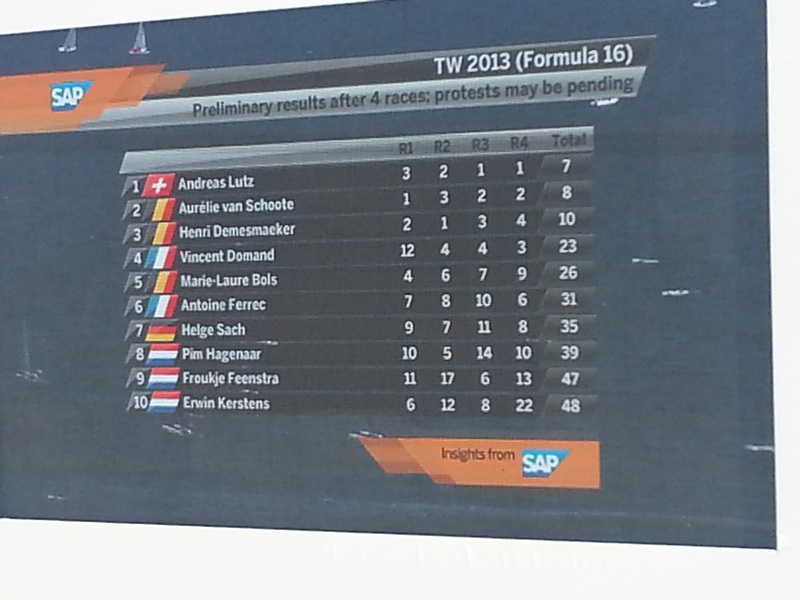 Falcon scored a great result at this Formula 16 worlds. Aurélie and Morgan, on BEL 666, took the silver medal home, making them Vice World Champions F16! Well done to both. They were really sailing top notch. At this young age, make sure you watch their future sailing events! They are an RBSC mixed youth team and sailing their first event together. 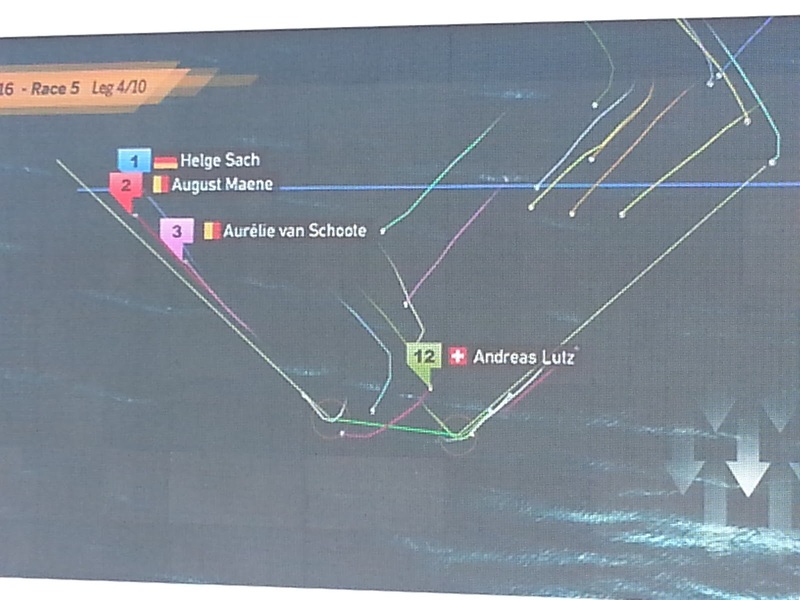 Ruling the fleet in the light to medium wind and just a little less consistent in the higher winds as Aurélie never sailed an F16 before. 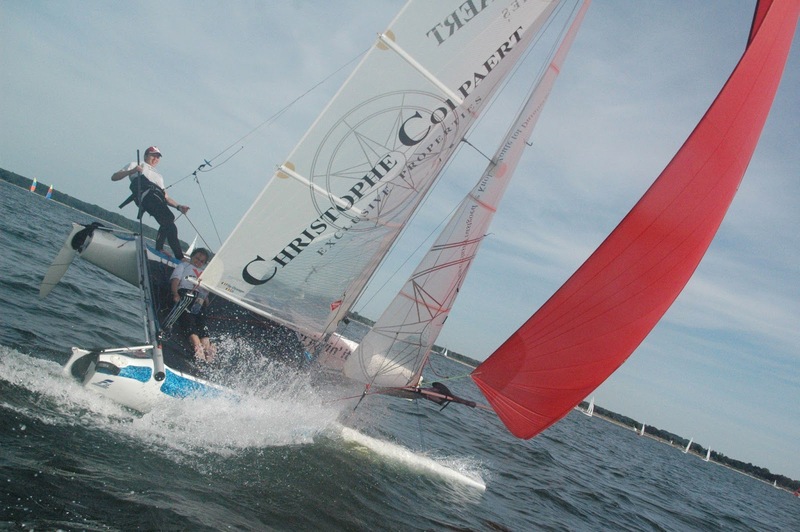 Both have a lot of monohull experience and this shows. Awesome result! When we took the initiative together with the sponsors to setup an F16 youth team last year we could have never guessed the results the youths have sailed on this F16 worlds. 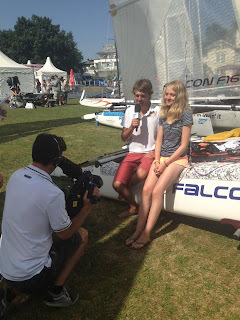 We started with 3 Falcon F16's and had to convince quite some people this was the way to go, one year later there are more than 10 youth teams competing from Belgium and Holland in the worlds and sailing for top positions, great to see! We are of course extremely happy with the Falcon performance as well. Winning Belgian, US and Italian titles last year, finishing 2nd, 7th and 8th on the worlds is a great confirmation of what we can achieve. 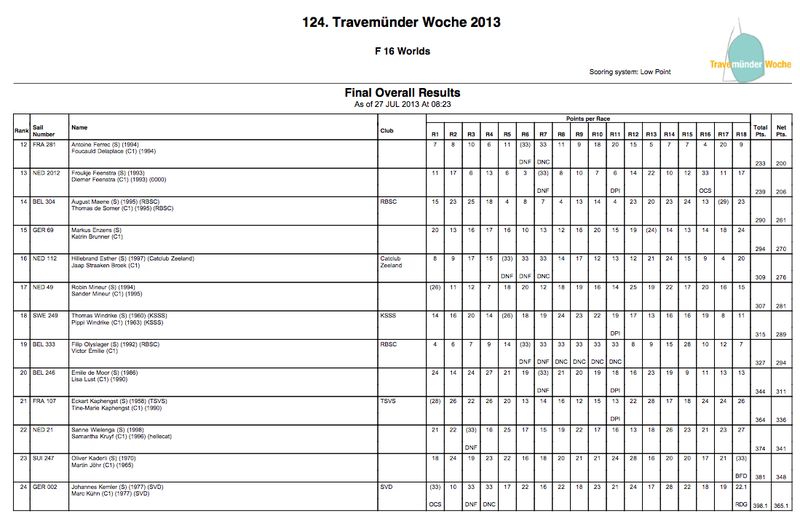 The 8 Falcon teams sailed 18 races over the 5 days. A great mix of low, medium and high wind conditions over the week ensured the teams with the best overall performance stood out. 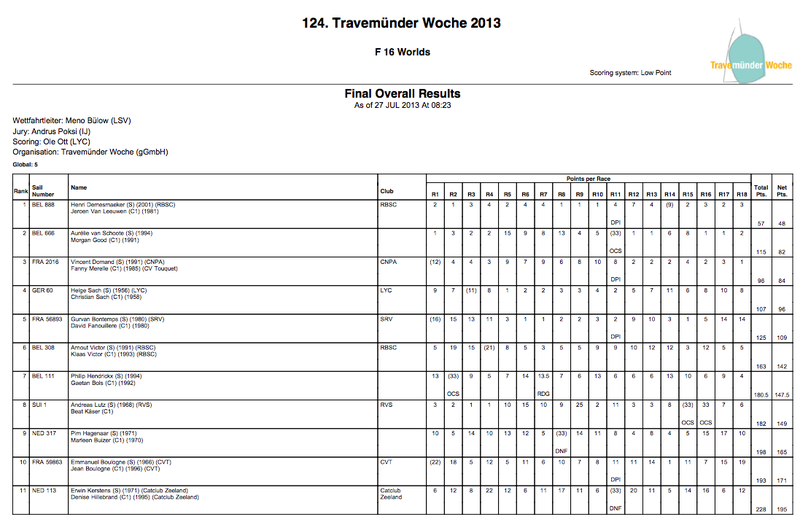 Different countries were represented with a different mix of crew weights and configurations: LUX 001 (men - 31st), NED 237 (single handed - 27th), GER 002 (men - 24th), BEL 246 (mixed - 20th), BEL 333 (mixed youth - 19th), SUI 001 (men - 8th), BEL 111 (men youth - 7th), BEL 666 (mixed youth - 2nd).